Malko Turnovo is a small town (the only one in the Bulgarian part of Strandja) located just in the heart of the mountain. The settlement has been founded in the Antiquity although under a different name, which the historians have so far been unable to find out. Strandja mountain around Malko Turnovo looks different from Eastern Strandja. The town is nestled in a karst valley surrounded by bare hills, the one to the west of the town being the highest peak in Strandja - Goliamo Gradishte (709 m). To compensate for the less scenic view the town abounds in historical, archeological, architectural and ethnographic monuments, findings and sights. The oldest finding - the bronze ax - dates as far back as the second millenium BC. Our tour of Malko Turnovo starts at the Museum of History. It was founded in 1983 with the purpose of becoming a regional informational center. At present it has big collection, exhibited in five traditional Strandjan houses, each of them an architectural monument. The collection includes finds from different ages. The Antiquity is represented with stone inscriptions, sacrificial altars, tomb stones and pediments, marble statues and parts of statues, ceramics. The exhibition includes as well some unique masterpieces of the Bulgarian icon-painting art, typical only for the Strandja region. The museum collection also features various objects, revealing the way the local people used to live (tools, utensils, costumes, etc. ), photographs and documents, showing various events from the National liberation movement and many other items connected in one or another way with the cultural and historical development of the region. Next our walk takes us to the town orthodox church "Assumption". It is not known when exactly the church was founded - according to an inscription on walls from 1830, the church was fully reconstructed once in 1754 and a second time in 1830. Then it underwent three major repairs so at present it looks comparatively contemparory. 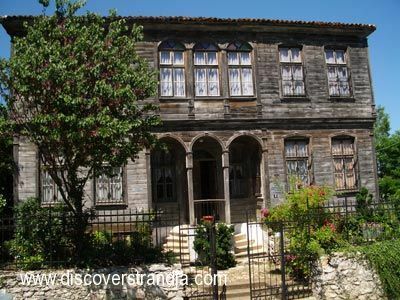 In spite of this it has preserved more than 100 old icons, wonderful samples of the Bulgarian revival Strandjan school. The iconostasis in front of the altar is another impressive piece of art, that is worth seeing. Not far from the orthodox church is the catholic church "Holy Trinity". Malko Tarnovo is actually the oldest catholic eparchy in Bulgaria with a history of more than 160 years, and it has always been a prime example of the two christian communities - catholic and orthodox. Then we are off to have some fun in the Museum of Natural Sciences. In spite of its serious name, its collection is presented in such a modern interactive way that even the kids would love to spend some time there. In a special phone cab, placed in the trunk of a huge old tree, we can hear the voices of the birds of Strandja. In another room we can record our attempts to imitate the Strandja animals and see who is best. There is a special beetle box, where the bravest can have a close look at the bugs, put under a magnifying glass. These is just a part from the surprises awaiting the visitors of the Museum, the rest we will see there. 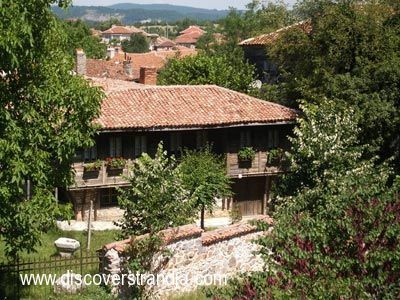 Before we leave the town of Malko Tarnovo, we will stop in the center to see the two famous springs "Golemia vris" and "Malkia vris" and drink from their healing water.